Woodland seafood seems to me like a rather dubious thing. I remember being introduced to Rocky Mountain Oysters as a kid via the classic “The Great Outdoors” (still one of my faves). In “Fear and Loathing” I remember when Gary Busey mentions the Land Crab, though to this day I’m not exactly sure what Land Crab is, it sounds like a distinctly bad word. Lobster mushrooms might sound weird, and they certainly look weird, but so far as woodland seafoods go, they are on the level. Once you get an eye for these delicious fungi they are difficult to miss, their bright, vibrant color leaps out of the dusky forest floor, and after you’ve been properly introduced, you are unlikely to ever mistake this guy with anything else. Mushroom Parasite that is Lobster colored doesn’t quite roll of the tongue as nicely though. 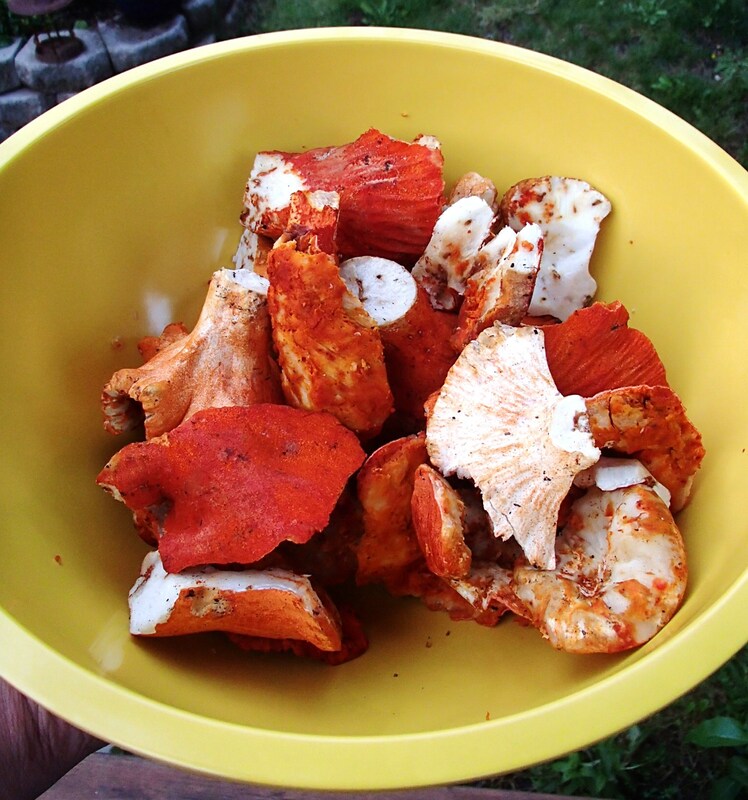 Lobster Mushrooms usually attack russulas or lactarius mushrooms, transforming them from inedible to edible in the process. 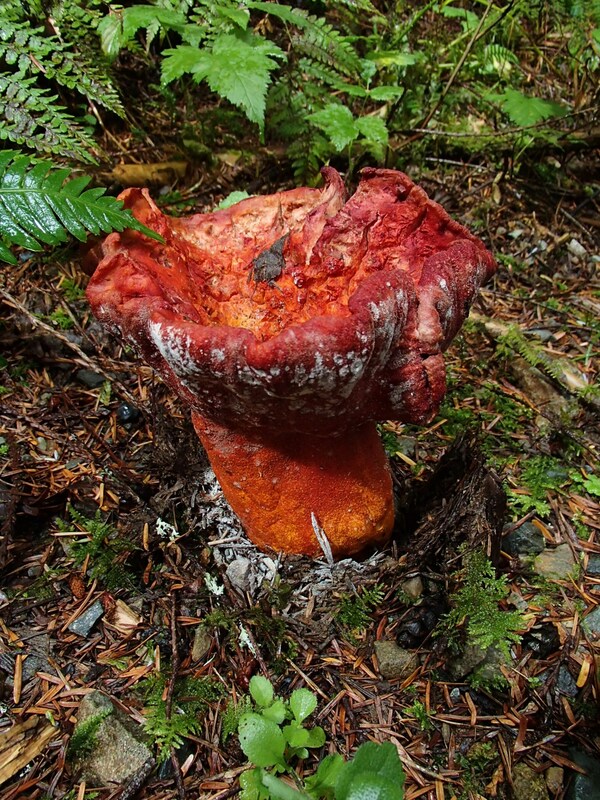 There is a a lobster mushroom on the east coast, Hypomyces hyalinus that parasitizes Amanita mushrooms (some of the most deadly mushrooms) turning them into a pimply or warty upright club, but this species is unknown on the west coast. 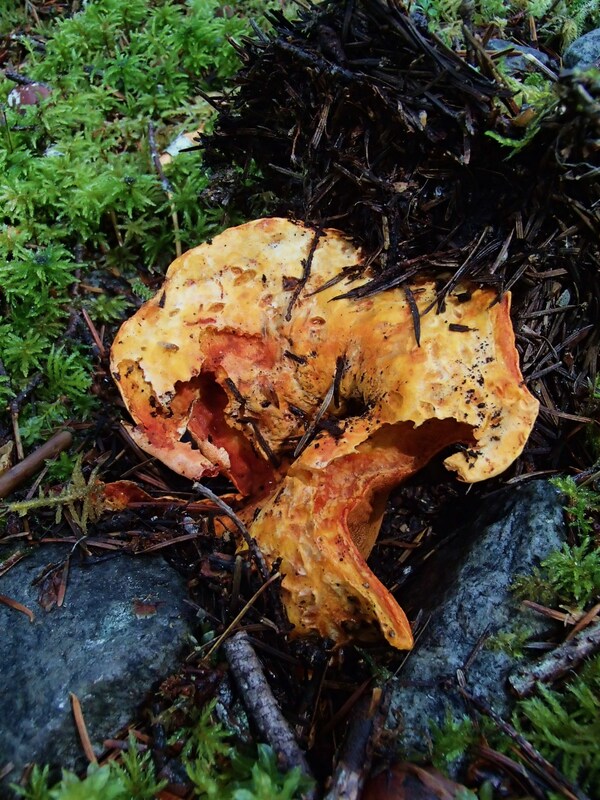 That being said, it seems there are no known poisonings by our local lobster, Hypomyces lactifluorum. It is interesting to note that in my experience the taste of these mushrooms varies greatly depending on what the host mushroom was. 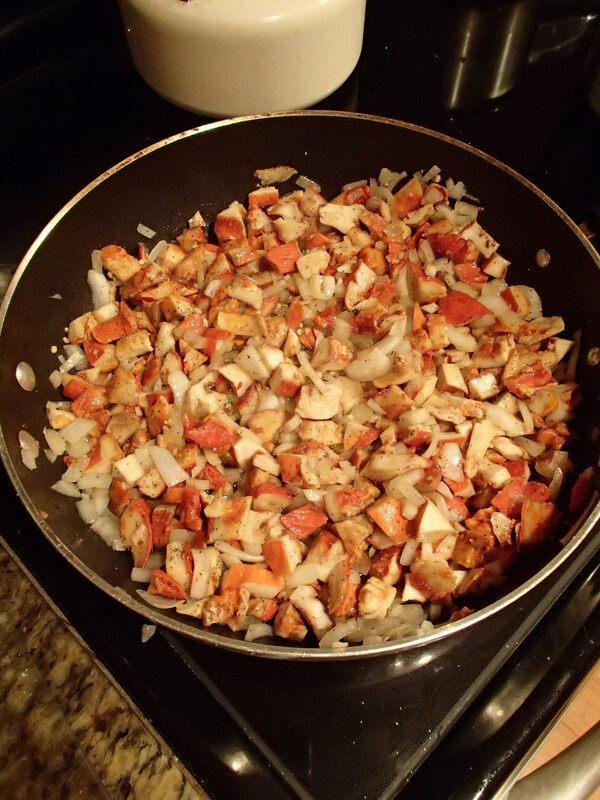 I have had the range from very peppery in flavor to quite innocuous, but always of very appealing texture and edibility. Lobster Mushrooms often seem to burst right out of the ground, and because of this, they are often pretty dirty, sometimes even seemingly impregnated with little bits of forest floor. 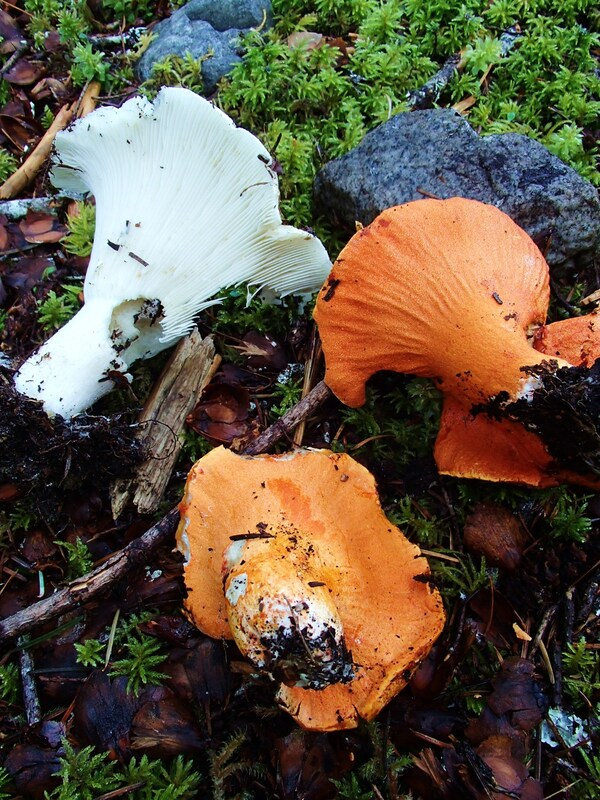 They seem to also be a favorite of the woodlands own mushroom connoisseurs, the beetles, flies and mushroom maggots. It takes a bit of work to clean up a lobster mushroom, and for this reason I encourage you to look your quarry over well before snatching it from the woods, sometimes they are just too forlorn to do anything culinary with and are best left to disperse their spores to make future generations of lobsters. Ok, so you’ve found yourself some Land Lobster, now what do you do with it? First and foremost, be absolutely sure of what you have. The internet is a great resource for sure, but I highly recommend field guides and even better and experienced mushroom hunter. There are two books I’ll highly recommend here “All the rain promises and more….” and “Mushrooms Demystified” both by David Arora. The first one is a great pocket guide and the second, which is often referenced by the first, is an expansive tome that you will certainly want should you delve further and further into amateur mycology. Second, lets clean up those lobsters! You’ll need a bush, something with moderately stiff bristles as some of the grime is tenacious. I start with a good superficial brushing before storage and then, when ready to prepare, I’ll cut the lobsters up into more manageable chunks to really eradicate the crud. It’s best not to get the mushrooms wet, as this can really make them soggy, and to go back a few paragraphs, if they are SO cruddy that you’d need to wash them, maybe they are best left in the woods. 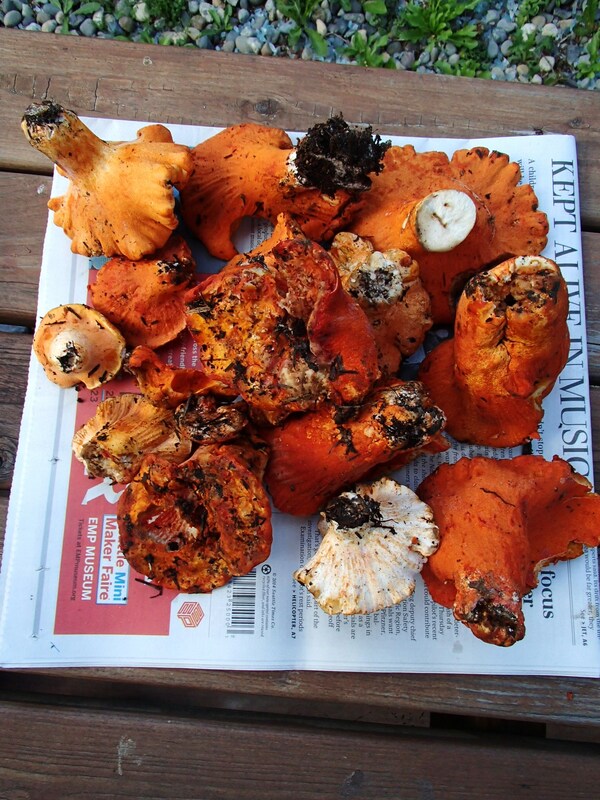 Lobster mushrooms and be cooked immediately or dried for future use. Drying, so it’s been said, can concentrate the flavor making for savory soups or whatnot. On the drive home an image came to me, it was a heavenly image of sauteed lobster mushroom served over noodles and white sauce. and the Voila! 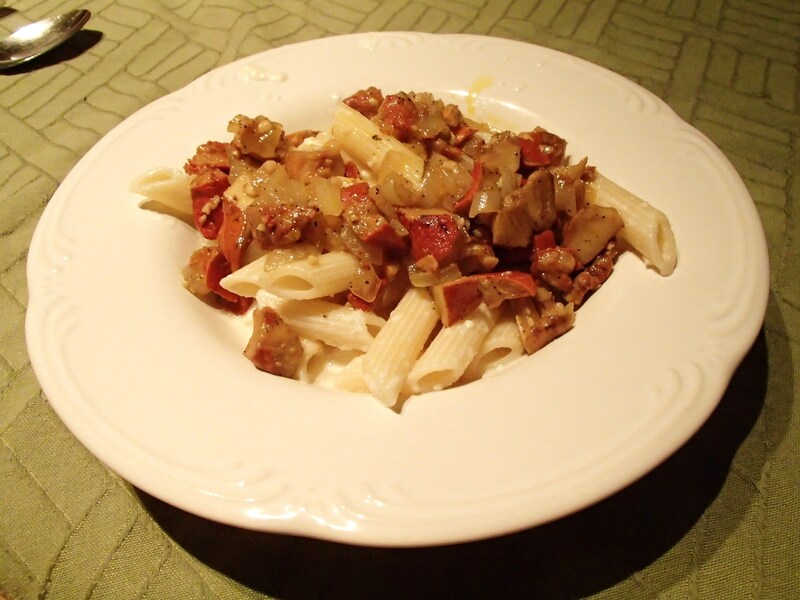 I had my Woodland Seafood Pasta! 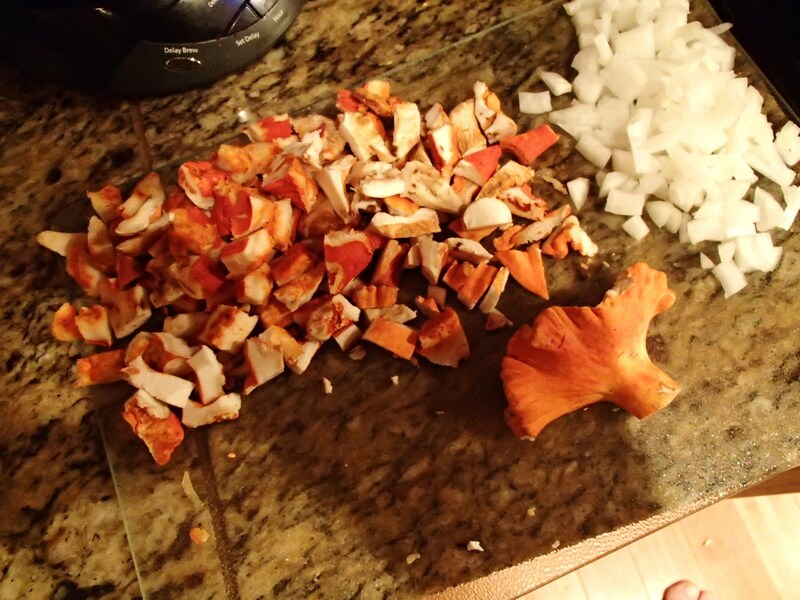 Lobster mushrooms are versatile in the kitchen, fun to find and a good beginners fungi for that first step into the wonderful world of mycology. That being said, I’ve got a surprise day off today so I’m heading off to look for more, Happy trails and happy hunting!